One of the challenges of mobilising thousands of soldiers is telling them apart. Unlike the eye-catching uniforms of the 19th century, most armies during the First World War employed a uniform that matched more easily into the surrounding landscape. By the end of the war even the highland units were using a form khaki battledress in the British Army, though they kept their kilts, and the French had all but abandoned the distinctive blue and red uniform of the earlier years of the war. But, if everyone looks the same how do you know what unit they’re from? Image: [Tunic, 2nd Canadian Mounted Rifles], [no date], Collections CCGW/CCGG. Quick identification, especially in battle, was extremely important. 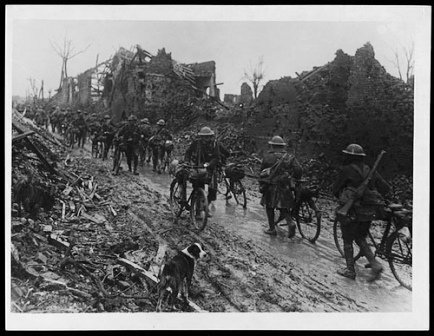 A commander needed to know which units were on the left and right, who might be a gunner, or if the man riding down the road on a bicycle was part of the cyclist corps and could deliver messages. One of the ways to do this was the use of identifying patches and markings. In the case of the CEF, the path to unit markings was a somewhat convoluted one. The original model used at Valcartier involved coloured straps, and in later years the Canadian Corps called for rectangular patches worn at the back of the collar, and other designs, before finally arriving at the divisional patch system in 1917. Service, rank and wound markings were all used earlier and based on the British model. 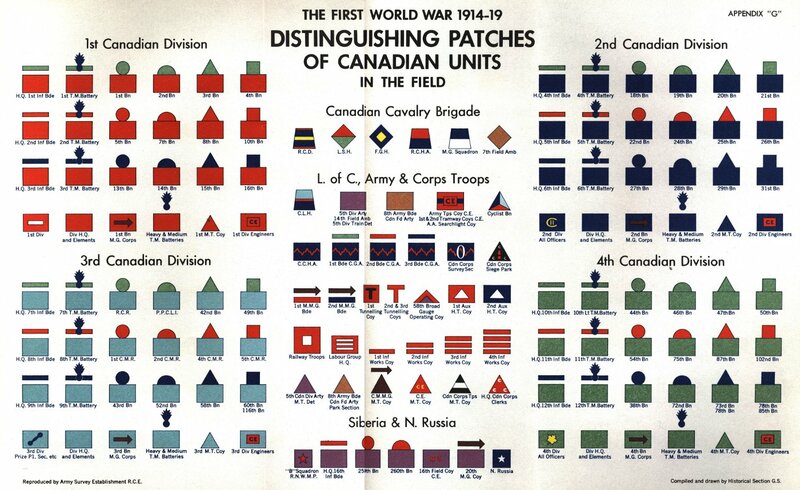 The Canadian system divided up each division into its composite battalions and corps, all symbolised by a variant addition to the square divisional patch. As well as patches, uniforms could show a soldier’s function within the unit. Lewis gunners for instance wore a decorative “LG” patch on the forearm of their left sleeve. Rank was also displayed on a man’s sleeve, if he was overseas, as well as the length of his service, and if he had received any wounds. Soldiers essentially carried around a small snapshot of their position both within the battalion and within the larger division, making it easy to know who was who at a glance. In the case of the uniform in the photograph above we don’t know the identity of the soldier who wore it; however, from his sleeve we can tell a lot about him. For orientation purposes, the sleeve would be the man’s right. Firstly, his divisional patch shows that he is a member of the 3rd Division, the marking about the divisional patch, as well as the identification patch above name him as a soldier with the 2nd Canadian Mounted Rifles. His should title also identifies him as a Canadian soldier. Further down at the cuff we can see that he has four years service on the front, from the four chevrons. The most interesting (to us anyway) feature of his sleeve though is the pin, showing a harp and crown. The pin denotes that the man was a member of the battalion band and is almost identical that worn by band members in the British army. With a uniform like this, one that is so well-marked, even if the soldier’s name has been lost to time, parts of his story can still be told.